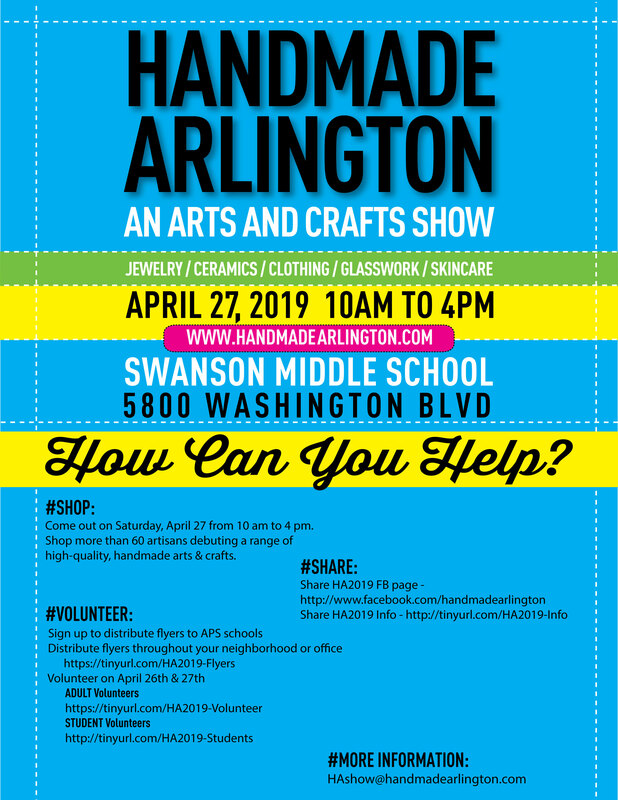 HANDMADE ARLINGTON 2019 is returning to Swanson Middle School on Saturday, April 27 at Swanson Middle School from 10AM to 4PM. HANDMADE ARLINGTON is a great arts and crafts show that raises funds for Swanson PTA. HA2019 will have more than 60 arts and crafts makers including many returning favorites and some great new ones too. We’re really excited about HANDMADE ARLINGTON 2019, and your help can guarantee its success. #SHOP:Come out on Saturday, April 27 from 10 am to 4 pm. Shop more than 60 artisans debuting a range of high-quality, handmade arts & crafts.